A young woman has a car accident, but later she appears out of the river. 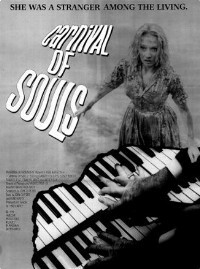 She moves town, gets a job as a church organist, but starts to see disturbing visions and loose touch with reality. This is a surprisingly engaging film, despite some of the problems with the acting, editing and sound. The plot builds the suspense and the interest well. A good example of horror without blood and gore.